For other people named Tony Richardson, see Tony Richardson (disambiguation). Cecil Antonio "Tony" Richardson (5 June 1928 – 14 November 1991) was an English theatre and film director and producer whose career spanned five decades. In 1964 he won the Academy Award for Best Director for the film Tom Jones. 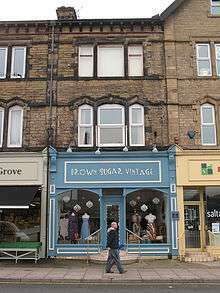 Richardson was born in Shipley, West Riding of Yorkshire in 1928, the son of Elsie Evans (Campion) and Clarence Albert Richardson, a chemist. He was Head Boy at Ashville College, Harrogate and attended Wadham College, Oxford, where his contemporaries included Rupert Murdoch, Margaret Thatcher, Kenneth Tynan, Lindsay Anderson and Gavin Lambert. He had the unprecedented distinction of being the President of both the Oxford University Dramatic Society and the Experimental Theatre Club (the ETC), in addition to being the theatre critic for the university magazine Isis. Those he cast in his student productions included Shirley Williams (as Cordelia), John Schlesinger, Nigel Davenport and Robert Robinson. Richardson was married to actress Vanessa Redgrave from 1962 to 1967. The couple had two daughters, Natasha (1963–2009) and Joely Richardson (born 1965), both actresses. He left Redgrave for actress Jeanne Moreau, although the marriage he had anticipated never materialised. In 1972 he also had a relationship with Grizelda Grimond, who was a secretary for Richardson's business partner (ex-partner, by that time) Oscar Lewenstein, and the daughter of British politician Jo Grimond. Grizelda gave birth to his daughter, Katharine Grimond, on 8 January 1973. Richardson was bisexual, but never acknowledged it publicly until after he contracted HIV. He died of complications from AIDS in 1991. In 1955, in his directing debut, Richardson produced Jean Giraudoux's The Apollo of Bellac for Television with Denholm Elliott and Natasha Parry in the main roles. Around the same time he began to be active in Britain's Free Cinema movement, co-directing the non-fiction short Momma Don't Allow (also 1955) with Karel Reisz. Part of the British "New Wave" of directors, he was involved in the formation of the English Stage Company, along with his close friend George Goetschius and George Devine. He directed John Osborne's play Look Back in Anger at the Royal Court Theatre, and in the same period he directed Shakespeare in Stratford-upon-Avon. Then in 1957 he directed Laurence Olivier as Archie Rice in Osborne's next play The Entertainer, again for the Royal Court. In 1959, Richardson co-founded Woodfall Film Productions with John Osborne and producer Harry Saltzman, and, as Woodfall's debut, directed the film version of Look Back in Anger, his first feature film. 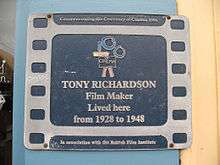 In 1964 Richardson received two Academy Awards (Best Director and Best Picture) for Tom Jones (1963). His next film was The Loved One, during which he worked with established stars including John Gielgud, Rod Steiger and Robert Morse working in Hollywood both on location and on the sound stage. In his autobiography he confesses that he did not share the general admiration of Haskell Wexler, who worked on The Loved One as both director of photography and a producer. Among stars that Richardson directed were: Jeanne Moreau, Orson Welles, Trevor Howard, David Hemmings, Nicol Williamson, Marianne Faithfull, Richard Burton, Anthony Hopkins, Mick Jagger, Katharine Hepburn, Paul Scofield and Judi Dench. His musical composers included Antoine Duhamel, John Addison and Shel Silverstein. His screenwriters were Jean Genet, Christopher Isherwood, Terry Southern, Marguerite Duras, Edward Bond (adapting Vladimir Nabokov) and Edward Albee. Richardson and Osborne eventually fell out during production of the film Charge of the Light Brigade (1968). The basic issue was Osborne's unwillingness to go through the rewrite process, more arduous in film than it is in the theatre. Richardson himself had a different version. In his autobiography (p. 195) he writes that Osborne was angry at being replaced, in a small rôle, by Laurence Harvey to whom the producers had obligations. Osborne took literary revenge by creating a fictionalised and pseudonymous Richardson – a domineering and arrogant character whom everyone hated – in his play Hotel in Amsterdam. Stylistically, Richardson's work was highly varied. Mademoiselle was shot noir-style on location in rural France with a static camera, monochrome film stock and no music. The Charge of the Light Brigade was part epic and part animated feature. Ned Kelly was what might be called an Aussie-western. Laughter in the Dark and A Delicate Balance were psycho-dramas. Joseph Andrews was a return to the mood of Tom Jones. He financed the escape from Wormwood Scrubs prison of the spy and double agent George Blake in 1966. In 1970 Richardson was set to direct a film about Vaslav Nijinsky with a script by Edward Albee starring Rudolf Nureyev as Nijinsky, Claude Jade as Romola and Paul Scofield as Diaghilev, but producer Harry Saltzman cancelled the project during pre-production. In 1974 he went to Los Angeles to work on a script (never produced) with Sam Shepard, and took up residence there. Later that year he began work on Mahogany (1975), starring Diana Ross, but was fired by Motown head Berry Gordy shortly after production began due to creative differences. Richardson made four more major films before his death. His last, Blue Sky, was released posthumously and won a Best Actress Oscar for Jessica Lange. 1954 The Changeling Wyndham's London 1 perf. 1956 Look Back in Anger Royal Court London 151 perf. 1958 The Chairs & The Lesson Phoenix New York 17 perf. 1959 Look After Lulu! Royal Court London 45 perf. 1960 A Taste of Honey Booth, Lyceum New York 376 perf. 1961 Luther Royal Court London 28 perf. 1961 Luther Phoenix London 239 perf. 1962 A Midsummer Night's Dream Royal Court London 29 perf. 1963 Natural Affection Booth New York 31 perf. 1963 Semi-Detached Music Box New York 12 perf. 1963 Arturo Ui Lunt-Fontanne New York 8 perf. 1964 The Milk Train... Brooks Atkinson New York 5 perf. 1969 Hamlet Lunt-Fontanne New York 52 perf. 1 2 " "The cursed legacy that still haunts Vanessa Redgrave". Daily Mail. UK. 7 May 2011. ↑ "John Quine". The Daily Telegraph. London. 12 June 2013.